This recipe was on Down Home with the Neely's and was part of their Halloween episode this year. I have been wanting to make whoopie pies since I had one on our vacation back in May. I also love chocolate and pumpkin together (which I know sounds so weird, but is so good! ), so I just had to try them. I made these for one of my Thanksgiving dinners. Since I was traveling 3 hours, I put them in the freezer the night before to help keep them cool. 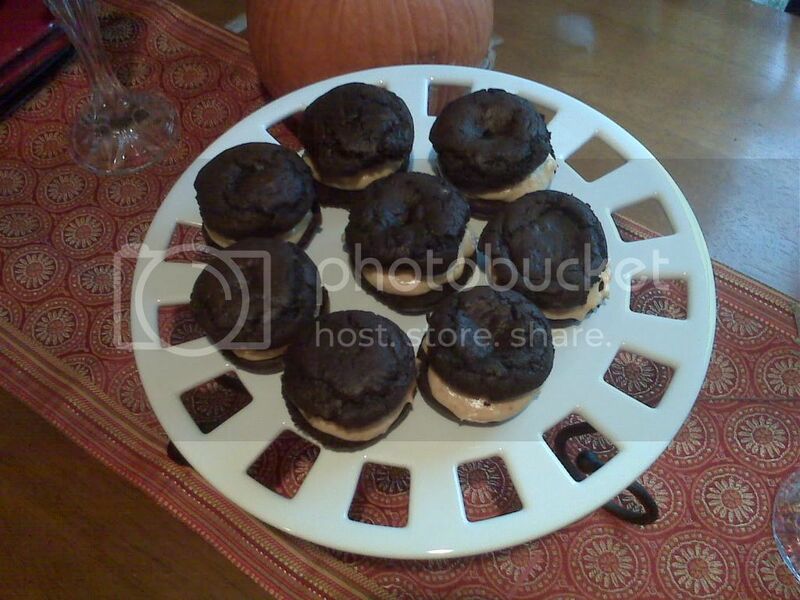 The chocolate cookie part isn't too sweet, which is great since the pumpkin cream cheese filling is very sweet. The two parts compliment each other very well. I also purchased a whoopie pie pan from Crate and Barrel. It was only $12 but it didn't work out as well as I had hoped. I think if you just put some parchment paper down, it would work just as well. Using a stand mixer, add the butter and sugar and beat together until light and fluffy. Add the egg, then the buttermilk and the vanilla. Whisk together the flour, cocoa powder, baking soda, baking powder, and salt in a medium bowl. Add the dry ingredients in increments to the wet ingredients. Mix until just combined. Drop heaping tablespoons of the batter onto parchment lined sheet trays, leaving a 2-inch space between each cookie. Put in the oven and bake for 8 minutes. Remove from oven and let cool on rack. Beat together the cream cheese and butter, in a small bowl, until smooth. Slowly add in the confectioners sugar. Once smooth, add the pumpkin puree, the cinnamon and a pinch of salt. Beat until smooth and well mixed. To assemble the cookie, spread a heaping tablespoon of the filling to the flat side of a cookie and sandwich with another. Repeat with the remaining cookies. Transfer to a serving platter and serve.